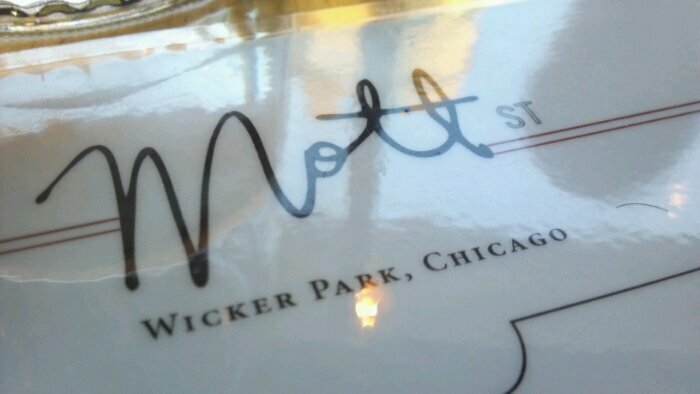 Mott Steet – named after the main street in New York’s Chinatown, (1401 N. Ashland Ave.) has an address on its exterior. Besides that and its (extremely hard to miss) bright red paint job, there isn’t any signage for one of Chicago’s newest and most awaited spots for eccentric grub. 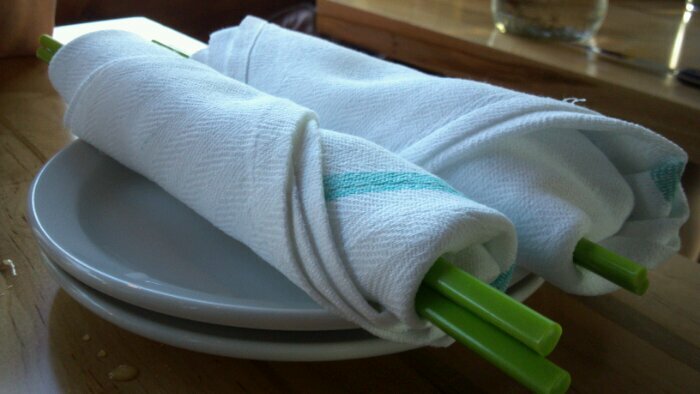 It gets harder and harder to label restaurants’ cuisine these days. 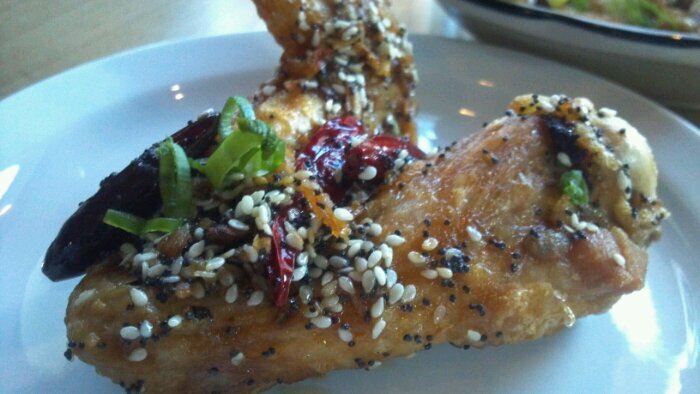 Absolutely fusion, this Asian influenced American joint is one others should emulate. As it was only in it’s second week of business we decided to arrive early. Because the patio was full, we were seated at one of the last tables in the main dining space. Rustic, minimal and sleek is how I’d describe the decor indoors. Lots of neutral colors highlighted by touches of vibrant lively shades of green, blue and red spot the dining room. As this was a “snack” before dinner later – I know, I know, we only ordered two items. 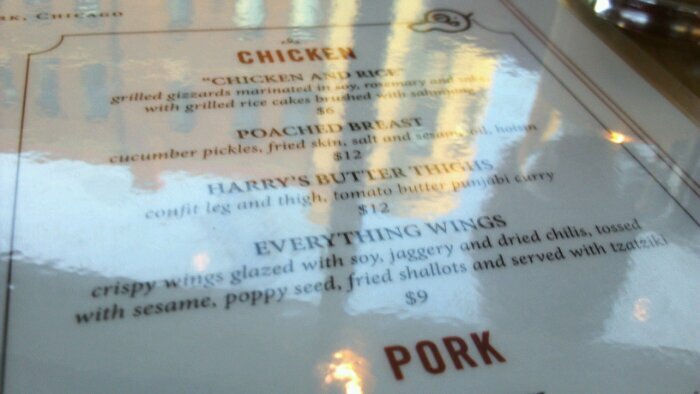 First up was something we planned ahead on ordering – the “Everything” Chicken Wings. Jumbo un-halved wings were placed before us. 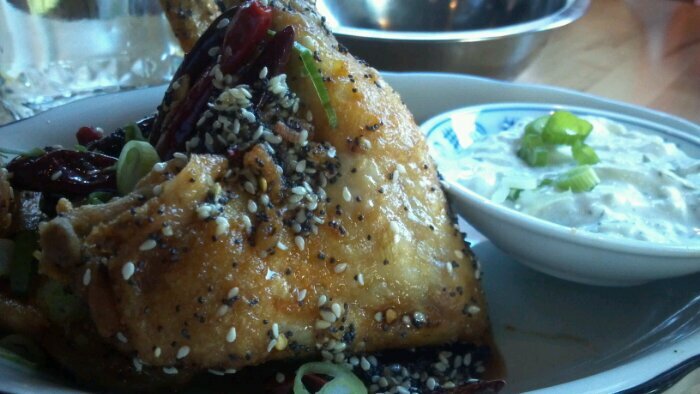 Covered in a mix of, well, everything…poppy and sesame seeds, two types of chilis, fried shallots and tzatziki sauce. They were delicious. Fried naked and just right. Super juicy chicken meat that itself was extremely flavorful. Then the coating – it just worked so well. It was like an everything bagel meets the chicken wing. The sauce was tangy, sweet and had a nice kick to it. A unique, I’d say Asian style wing sauce. 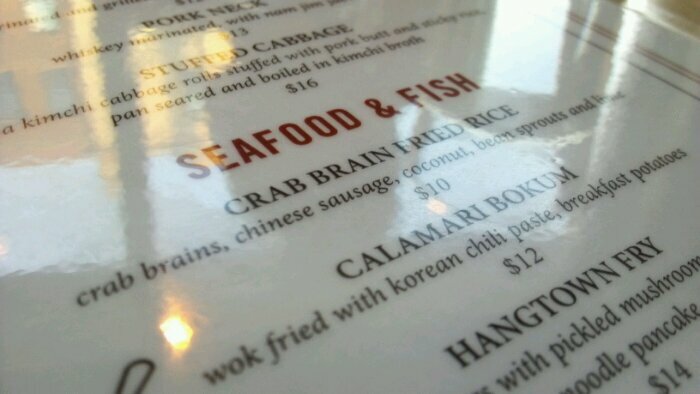 The second item was also preplanned, and the server heartily agreed with our choice of the Crab Brain Fried Rice. The brain is one of the most overlooked parts of every animal. When it comes to the crab’s brain, I think it’s a perfect stepping stone for those who have yet to try land dwelling animal brain. It’s more mild and tastes mostly like the ocean – a great sign of freshness. 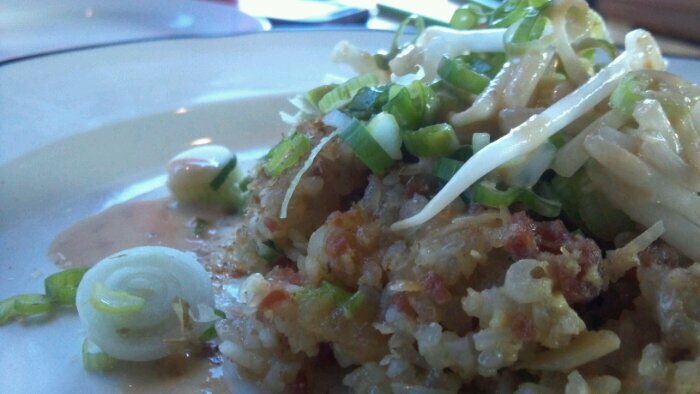 Deliciously and expertly fried rice is lightly mixed with sauteed crab brain and other veggies and seasonings. I assure you all, this is tasty. Yes, it is brain, but what’s so different about eating a muscle of an animal versus its brain? The flavors are exotic and pronounced overall. 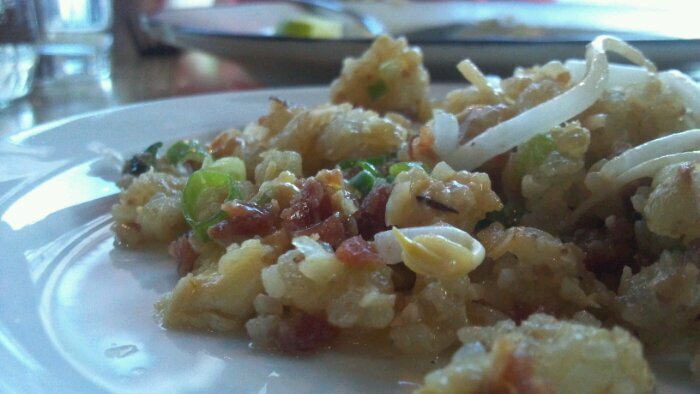 A little, fishy, like a fresh aquarium, a little savory, and very rich. You won’t find this dish at many, or any other spots…at least in this city…don’t you think you owe it to yourself to give it a shot? I thought so. Tell ’em Hungry Hungry Hinden sent ya. ← #135 – Kitsch’n on Roscoe. This Tuna Melts me!